What’s Up With … Mononucleosis? You’ve heard the term ‘Mono‘ or the ‘Kissing Disease‘ bandied about in the tennis world, but what is it and why is it so prevalent in the game? Mono in layman terms, a type of herpes virus, against which over 90% of adults are likely to have acquired immunity by the age of 40, which is characterized by fever, sore throat and fatigue. 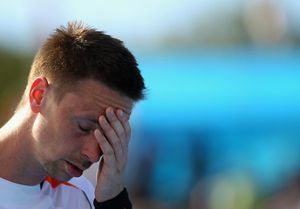 The fatigue part is a killer for tennis players, just ask Robin Soderling who has been out of the game for 2 years now with no timetable on coming back. Roger Federer suffered with it for a time but managed to make a recovery, so too has Marin Cilic and Vasek Pospisil. Mario Ancic never recovered from it and he retired at only 26. So why do tennis players get it so much? One of the biggest reasons is traveling on tour. It’s easy to catch a cold on a plane, easy to lose sleep, get jet lagged it’s a wonder that the players play at all. Their immune systems are probably better than most people because of their intense dietary and physical regimes but a virus is a virus and Mono is particularly tough to stop. Many players find themselves in confined spaces such as locker rooms and lounge areas, like any public space, it’s a germ farm. What about the kissing part? Ah yes, that. We don’t want to get anyone into trouble but you could say it’s part of the game. But however the virus makes its way in, the sharing possibilities via water bottles and shared facilities are infinite. All a player can do is be vigilant, get enough sleep and watch who they kiss. You would think that the French players would be the most susceptible, so Richard Gasquet better watch out! The mononucleosis virus is one of several viruses that trigger Myalgic Encephalomyeltis (sometimes called Chronic Fatigue Syndrome in the USA). M.E. is a devastating, often life-long disease with all the symptoms mentioned in these tennis articles, including the post-exertion fatigue, as demonstrated in the recovery-leading to exercise-leading to a crash again. The first advice in mono is DON’T PUSH, because it is the recovery mechanism that is broken. The flu-like symptoms that don’t resolve in a week or two are classic M.E. symptoms. I’m surprised that people are still calling it prolonged Mono. The first treatment is “don’t exercise if it doesn’t feel good, either while you are exercising OR after exercising”, as you have seen In many people. I realize this is especially difficult in the tennis world, but believe me, you don’t want to get M.E. And if you do, stop pushing immediately for a year or more or you will likely be sick for the rest of your life.